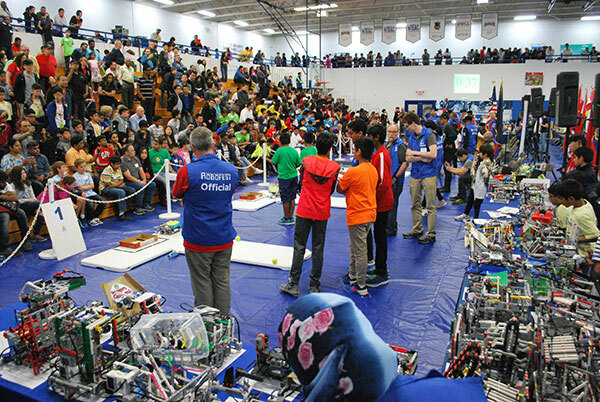 A world gathering of 100 teams of bright, young talent descended upon the Southfield City Centre recently to compete in the 19th annual Robofest at Lawrence Technological University. Students participated in a host of challenges and exhibitions to show off their coding skills, and their cultures. In addition to local students from Michigan and across the U.S., kids aged about 10 to 18, plus some college-aged students, traveled from Colombia, Hong Kong, South Africa, China, South Korea, and Canada to build, code, and challenge robots to carry out fully autonomous tasks. This year’s Robofest game challenged students to program robots to collect tennis balls, drop them into a box, and knock water bottles off a table. In addition to the “Autonomous Tennis Ball Challenge,” students participated in Sumo events, a RoboParade, a talent show, and much more. Autonomous technology programmed into these robots means they operate not by remote control, but through various sensors built into their hardware. This is the same technology being used to develop the autonomous vehicles of the future. The event also hosted WISER, the World Conference on Integrated STEaM Education through Robotics, where educators and other stakeholders gathered to talk about educational models, with specific sessions highlighting efforts in India, France, and Hong Kong. Sponsoring organizations for the world competition included Toyota, DENSO, Mobis, the Michigan Council of Women in Technology Foundation, the National Defense Industrial Association Michigan, and others. The entire Robofest concept was created by C.J. Chung, PhD, professor of computer science at Lawrence Technological University. We chatted with Chung about the event, about the value of robotics in Michigan, and what’s next for Robofest. What was your initial goal when founding Robofest? I’m a professor of computer science, and, 19 years ago when I saw the first Lego robots, I thought this would be a great tool for computer science education. Robots are mechanical and electrical, but the most important part of future robots and robotics are learning and developing software. What has changed since the first Robofest? At the time, for example, my first robot cost around $3,000. That’s my first robot. Nowadays the cost of kits for children is around $300. Now it’s much more accessible to use robots for education. That’s the big difference. But computer programs must have also changed since then. The difficulty of coding remains the same. But now there are many good tools to write code. Scratch coding has become popular. Even children can write code nowadays. In Robofest we encourage the use of scratch coding to make programs for robots. There are two main age divisions. The Junior Division is fifth grade to eighth grade, so upper elementary and middle school. The Senior Division is ninth to twelfth grade. There is also a small competition category, the Vision Centric Challenge for college undergrads and graduate students. This year for this division, kids from Hong Kong and Mexico participated, but no US teams. Challenge was too hard; even my students couldn’t solve the problem! We have been doing this challenge for about 12 years. It doesn’t even matter who wins because the kids learn a tremendous amount just by participating. Can you talk about the value of being part of this event for participants, even if their team does not win? The main goal of this competition is for learning, not for winning. We always stress that for students. This year we did some research and learned that the kids’ skills improved after the second level. To come to LTU they have to pass a qualifying competition locally before they can compete in main category teams. Every team learned more when they try a second time. They improved their coding skills and problem-solving skills after the second round. What are the hidden benefits to the participants? The event is mainly for STEM learning. But we focus on soft skills. Communication, leadership, teamwork and problem-solving skills. What do the sponsoring companies get out of their participation? Some sponsors are directly sponsoring teams. They have a connection with the team. Also, they benefit because they can create a pipeline that they could hire talented students in the future. What Robofest is doing is quite similar to the development of self-driving and connected vehicles. Sponsors provide the ability for their company names to be recognized by the young students to remember as sponsors so in the future they can be employees. The learning part. I learned a lot while I created the competition. There’s the technical learning, but also the learning about many other aspects of society. Twelves countries participated. I learned a lot about their cultures, their views about education and about families. Officially, we have a program called RoboParade. Theme was world culture. Interesting floats to represent their culture. It’s a great thing to watch the parade represent different cultures around the world. From a future talent perspective, how does having this event in the Detroit region, in Southfield, in Oakland County, foster a sense of connection to this part of the world? Metro Detroit is the automotive sector. Automotive technology is moving toward self-driving and connected vehicles. All the technologies learned in Robofest are connected to the development of future self-driving and connected vehicles. This started in metro Detroit and has strong impact to the world. Our area is leading the tech for the future by training young people first. How does the Robofest event help showcase LTU? LTU is offering scholarships for any Robofest students coming to LTU to study. We value their experience, so automatically they can get scholarships of $3,000 per year, up to $12,000. That’s in addition to any other scholarship they would get. Robofest will celebrate 20 years next year. What can you share about the future of Robofest? Because the field is growing so much, you can never know everything, and that’s why it’s so important to participate in this type of event. Am I correct? The most important technology to develop more is artificial intelligence, or AI. And that is software not hardware. That’s why coding is important. And Robofest is one of the best programs to learn more about coding and computer science. What else can you share about Robofest? To make autonomous robots, each is thinking about how to make them think, which is hard, and while we are doing that, we learn more. We learn more about why we make robots think. Same for me too. Whenever I develop a program for a robot, I learn more and a lot of new things. Remote control robots are popular, but they are not the future. We learn more through autonomous robotics. Also, we invited and hosted more than 500 people from outside of the country, which contributed to the local economy for that whole weekend. So that’s something, too.